Hey all, just got my OR-80 that I purchased over the summer back from my tech. A myriad of issues with it (mostly) sorted out, I'm looking to get some input on dating this thing. It was sold as a 72' OR-80. Looking at the Orange Field Guide, that seems to match up except that the FAC "squiggle" starts at the bottom, as opposed to the top like some have suggested for the 70's amps. I'm still not quite sure it's working correctly... it's super "farty" when you're not absolutely diming it, and if you do dime the amp, it squeals, even if the guitar volume is rolled down all the way. The knobs are not original, i'm working on a fix for that. Ordered some new ones from Orange directly but theyre the wrong spindle size. The OT is replaced with a Toneclone, any opinions on these? There was a bunch of issues with the amp, a severed trace in the feedback loop, a bad bias mod (was running the tubes lean), some incorrect resistor values were all contributing to an amplifier that was totally unplayable. All sold as a "fine, working condition amp"
The external shots I can see are not particularly helpful re working issues! The squeal is parasitic oscillation (poor wire routing - or more commonly a missing internal shield from the inputs. We cannot be sure what your tech did. It should be pretty clean and crisp up to half volume even with humbuckers. Hey LD50, Ill get some internal shots soon enough. I also suspected parasitic oscillation, but my tech was unable to reproduce this. Is this a problem that could react differently with a resistive dummy load? It's puzzling since its such an obvious problem, turn the volume up, the amp output clicks and dies (at least in the audible frequency range). ??? I might take it into my own hands and tool up here for some diagnostics. I have a history of working with high voltages and electronics, but I have faint knowledge on how tube amps work. It will take some studying. Is this a problem that could react differently with a resistive dummy load? It's puzzling since its such an obvious problem, turn the volume up, the amp output clicks and dies (at least in the audible frequency range). ??? Is the shield present inside (a lot turn up with them missing!)? Some amps use an aluminium shield to cover the bottom of the amp creating a 'Faraday' cage. Some amps only do this when the amp is out of the head cab and the guts are exposed! Decent hi res pics (global and close ups of the inputs) will probably be helpful. I just got back from a 3 month holiday in SE Asia, sorry for the late response. Feeling slightly rejuvenated, I disassembled the OR80 again and took some photos. I haven't learned much about it since then, my tech handed it back and said it was fine, it definitely doesn't sound or behave fine. The only thing I learned from his look-through was that it had been molested. Just how much, who knows, maybe ya'll can tell by the photos. I see relatively little original in there at all, from the output transformer, caps, most of the resistors etc all replaced. Obviously had a really hard life. One of the nicest Oranges I worked on (about 2 years ago)was a Pix only 120, the last Pix only a couple of months ago was not quite as sweet (brighter, slightly harsh - might have been the tubes?). Thanks for the insight LD50. Accepting that this thing has had a hard life, how should I move forward to getting it back to original glory? Even knowing what it's state is, I'm not ready to give up on it. I'd like to have this amp in my collection. 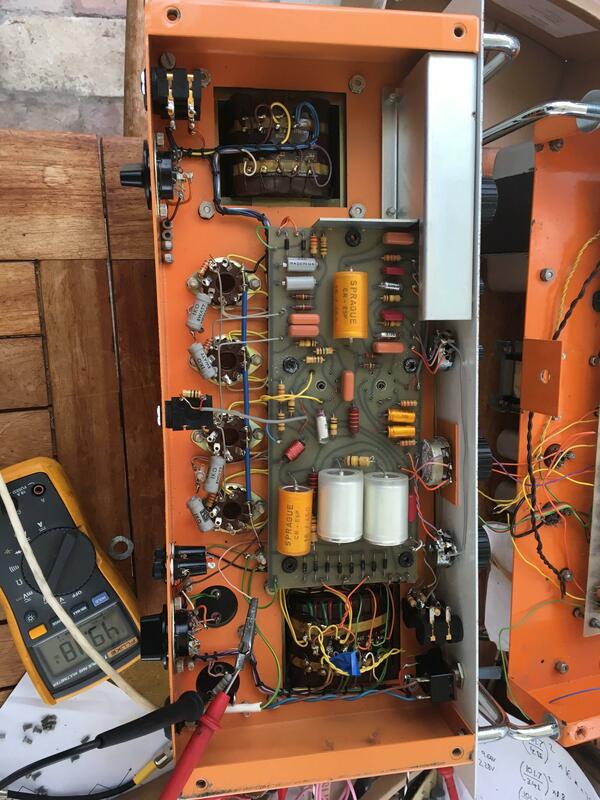 Are there any techs you know who could perform a restoration? Do you have any thoughts on replacement Mercury magnetics OT's vs the originals? I appreciate your help LD50. PS if this isn't the section for this discussion i'm sorry, maybe a mod can move it to the appropriate area. If you are in the US there is a guy I know in Texas that is pretty hot on these.